Last week I was looking through old posts (something I should never do because, yikes the photography was atrocious!) 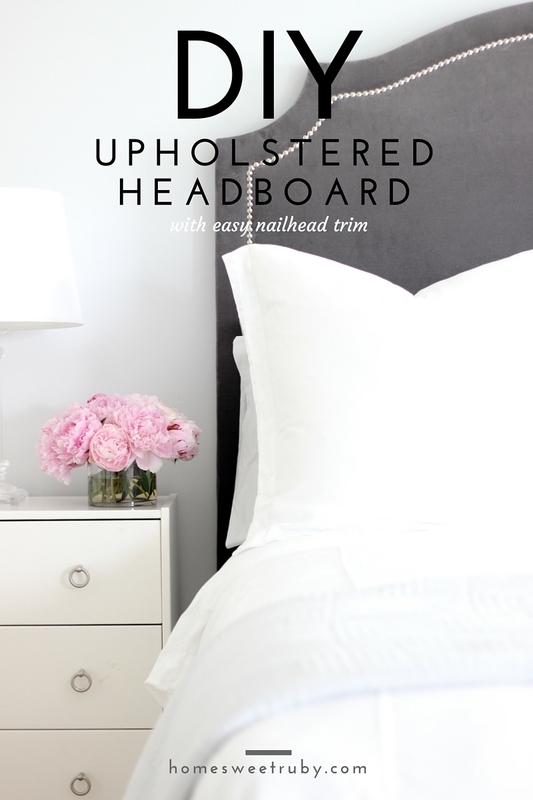 and I thought it was high time I updated one of my most popular posts, our DIY upholstered headboard! I'm happy to say that after almost three years, this headboard is still one of my favorite pieces of furniture in our house! And given our DIY inexperience at the time, it's both a shocking and proud moment that it still looks just as good. I still remember my perfectionist self fighting with this fabric, especially getting it over the curved edges without lumps and bumps, so consider yourself warned if you go with this shape and/or a velvet-like fabric! For step-by-step (but ugly) photos, see original post! First cut the plywood down to size. The most common questions I get about this tutorial are about the dimensions, so I hope this poorly done diagram helps! Next, sketch out the shape. I used a paper bag to make a stencil then traced the left side, flipped the stencil over, and stenciled the right. Line up your 1x6 boards on each side of the plywood, starting at the top (you'll need that jigsaw to cut the same shape as the plywood), and cut the bottom to your desired height. The legs of our headboard are 21" from the bottom of the headboard. 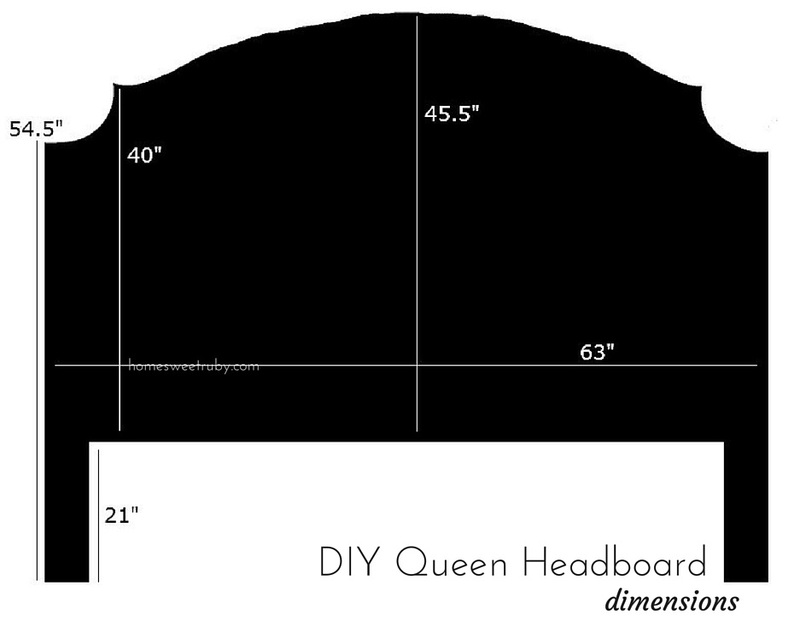 With your leftover plywood from the bulk of your headboard, cut the same shape to reinforce the top and the legs. That part was tricky for us because the leftover plywood wasn't the length of the headboard. We ended up having to piece it together and even though there are a few tiny gaps, those won't matter in the long run. Attach the legs and the frame pieces to the plywood with the wood screws, about every 6-8 inches. Now the fun part, upholstering! 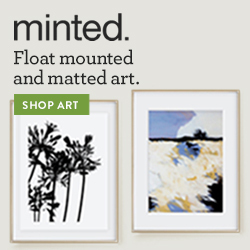 Cut your foam padding to fit within the frame you just completed. Spray the plywood with adhesive and stick the foam to the board. Next put the batting underneath (on the front side of your headboard) and get to stapling. You should know I went super crazy with the staple gun and you probably don't need to use as many as I did! Before moving on, trim all of the excess batting. Once you get to the actual fabric, it's basically the same process as the batting. If you can find an assistant, it helps to have one person pulling the fabric while the other does the stapling to keep everything taught. Save the curves and most of the top of the headboard for last. It helps to cut the fabric in 'V' shapes in the curved portions to minimize puckering. My fabric refused to cooperate and I almost cut it too far but luckily you never see the back of this thing! Upholster the legs in the same way you did the top half. Applying the nailhead trim was actually easier than I imagined. 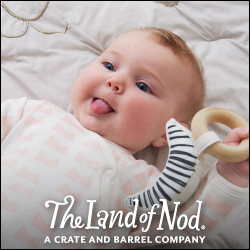 You only have to nail every 5th nail into the wood and its flexible enough that you can bend it however you need it for the curved portions. The trick is keeping it straight, so I used my leveler because it was the perfect width from the edge of the headboard. Once I got into a rhythm, this part only took about 20 minutes! I love how you can still see the nailhead trim and headboard fabric all the way down the sides of the mattress (which you can see in the photo above). 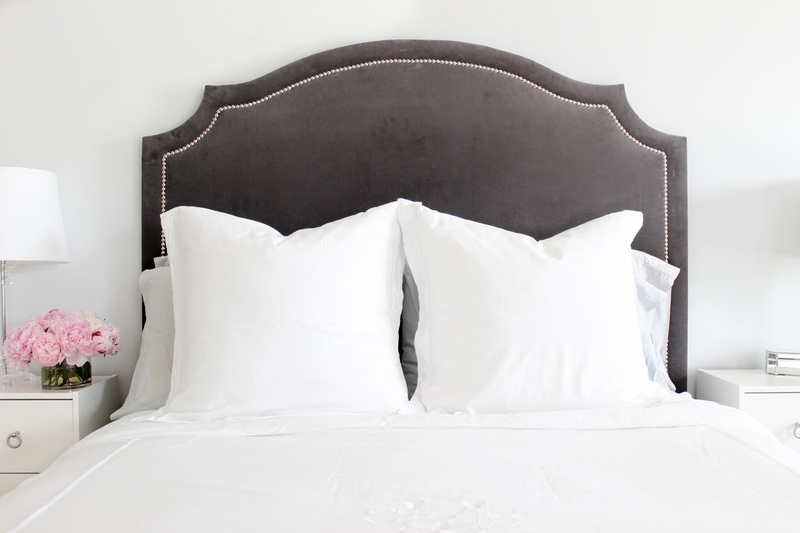 A lot of store-bought headboards stop at the top of the mattress and you can see the metal brackets, so a little extra effort here goes a long way in my opinion! 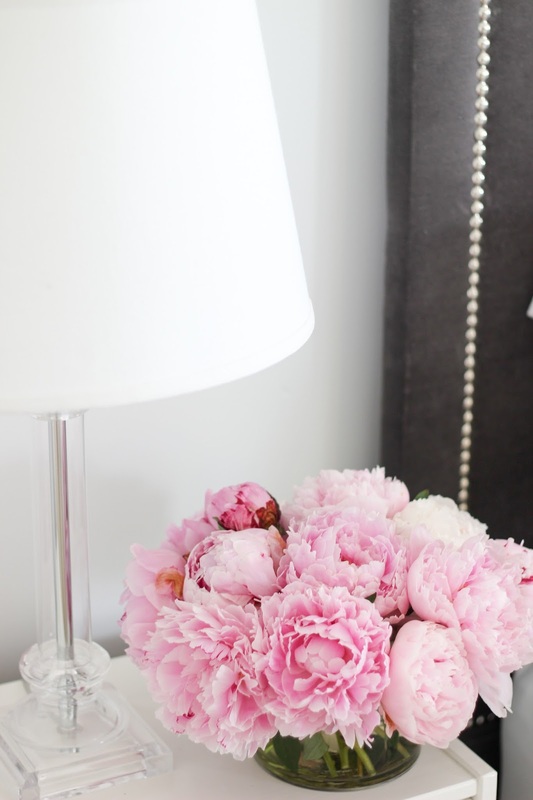 So there you have it, a prettier version of my DIY headboard! Let me know if you have questions, I hope this new diagram was helpful! Now I just need to get some artwork and pillows for this space. If you have a favorite shop for pillows please share! Can you make me one when we become neighbors? MMMk thanks! woah girl - this is GORGEOUS! I'm having major bedroom envy right now! 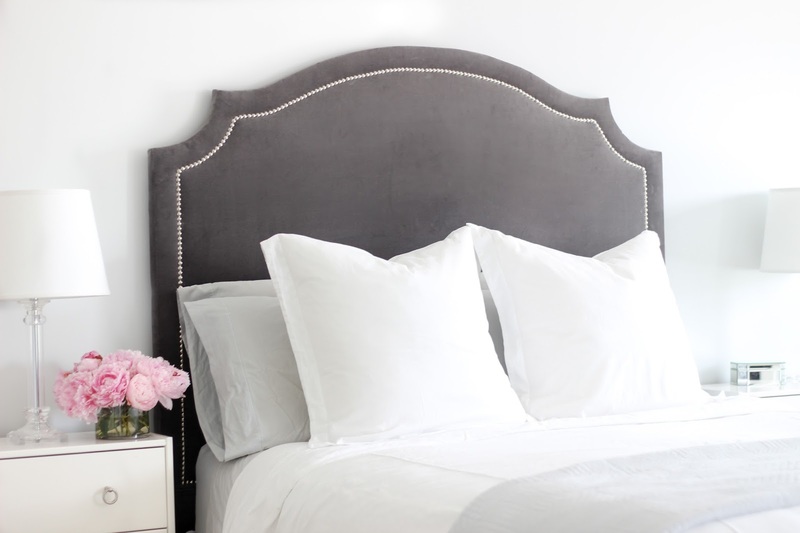 That headboard is gorgeous! You really hit the jackpot with Mr. Carpenter, Steve!